Imagine the following scenario. You go to the cinema, buy your ticket and your popcorn and after taking your seat, sit through 20 minutes of trailers and adverts before the start of the film. But, as the opening scene begins, you realise the sound's not working, and you can't understand a thing. The cinema staff run around fiddling with wires before deciding they can't fix it and, with that being the last screening of the night, you toddle off home with an apology and a free ticket for a future show. You'd feel gutted, wouldn't you? I mean, how often does that happen? Maybe if you were a glass half-full kind of person you'd figure that you were unlucky – you caught them on a bad night. For deaf people, the chain of events I've described isn't just a one-off – it's happened to nearly every deaf cinema-goer I know. Except it's not the sound that goes missing, it's subtitles. Which we need to understand the film. Right now, deaf film fans have very little trust left in cinema chains, and many people I know have stopped bothering; they prefer to watch DVDs (or, ahem, downloads) at home. Information about subtitled screenings is often inaccurate on cinema chains' own websites, so deaf people rely on a website called Your Local Cinema (which compiles accessible cinema times across the country) for the right times and dates. But deaf customers are still advised to check whether the subtitled screening is going ahead before they actually turn up. Even when you've confirmed the screening, asking to see a scheduled subtitled film once you reach the box office usually results in frantic phone calls to the projection booth. There's nothing quite like being responsible for holding up a queue of people to get your evening off to a pleasant start. You end up holding your breath until the opening credits roll. Sometimes the subtitles appear, sometimes they don't. I know people who have a drawer full of free vouchers, so often have they been let down. The name of a new Facebook group with over 700 members – Deaf people are alive 7 days a week, not just Sunday/Monday/Tuesday – hints at another issue deaf people feel angry about, the times and dates when subtitled screenings are scheduled. They are usually on off-peak days at off-peak times – hardly ever on Friday or Saturday nights. Tyron Woolfe, who started the Facebook group, told me the reason screenings aren't arranged at peak times is because "the consensus among cinemas is that they will lose money because they think hearing people do not like subtitles". I asked Woolfe why he set the group up. "My hearing partner and I are never able to watch movies at normal peak times or days. We were in Scotland recently, and could we go to a cinema? No, simply because we were there on the wrong day of the week. Digital technology should mean that any deaf person can go to any cinema screening and ask them to switch the subtitles on." Another of the group's members, Martin Griffiths, told me that three out of his last four visits to his local cinema in Cardiff ended without him seeing the advertised subtitled film. While his ticket was refunded, his travel and time were not compensated for. Missing a film might not seem like a big deal, but I know deaf people who've been let down on special occasions, or couples who've booked a babysitter so they can have their first night out in months, only to return home early, disappointed. As Woolfe says, "the reluctance to improve the service for deaf film fans is extraordinary. It's almost a 'like it or lump it' attitude. We have a right to much better access." Another form of access that helps deaf people enjoy films is loop systems, which offer the chance to hear the soundtrack directly, without background noise. Except cinemas don't always get that right, either. Last week, a deaf film-goer in Newcastle reported being told three times that his local cinema had an induction loop – only to discover, on closer inspection, that it, er, didn't. 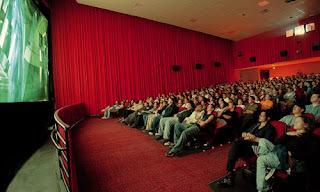 Ultimately, cinemas will only know the true potential size of the deaf audience when they give us reliable information, dependable technology, regular subtitled screenings (at decent times) and far better customer service. It's not only about complying with disability legislation – with one in seven people having some level of deafness, cinemas could take a positive view, and look at nurturing the deaf audience as a business opportunity. Until attitudes change, for deaf people, a visit to the cinema will remain a lottery. You might get lucky and have a great night, but there's a high chance you'll find yourself disappointed.